Thousands of miles from their motherland, Latvians in Siberia cling to their identity, as Philip Birzulis reports. Visited by starvation, mass terror and now the poverty of the new Russia, the people of Nizhnaya Bulanka have endured more than their share of 20th-century suffering. But the tale of this tiny village in the heart of Siberia is also one of extraordinary survival. At first glance its three dusty streets where chickens peck and horse-drawn carts trundle along may not seem like much. But the village has another, Latvian, name, Lejas Bulana, and most of its 200 inhabitants speak the language of their Latvian ancestors. Here, closer to Beijing than to Riga, a piece of Latvia has survived for over a century. While the story of Latvia's Western йmigrйs is well known, less told is that of the thousands who went East instead and whose descendants, an estimated 125,000 people, are scattered across the former USSR. Some are survivors of the mass deportations of the 1940s, while others are the offspring of Latvian communists who helped the Bolsheviks gain power in 1917. Then there are those who simply moved to take up jobs in the '70s and '80s. The people of Bulana predate them all. Long before Stalin, the czarist authorities were deporting undesirables to Siberia, plenty of whom came from Latvia. By the 1850s, Lutheran pastors sent to minister to them were finding it impossible to reach this scattered flock, and so the church fathers arranged that many of them were brought together in one place. 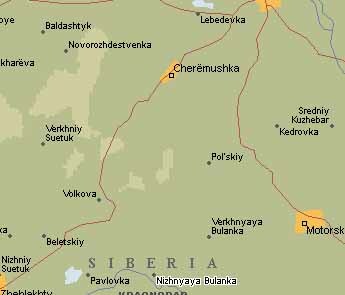 Bulana was established in 1857 along with Finnish, Estonian and German villages in the same district of southern Krasnoyarsk territory, in central Siberia. As in many frontier towns, Bulana had some wild early days of drunkenness and greed produced by the discovery of gold in the nearby Sayan Mountains. But its rich, black soil proved to be a more valuable asset, and free settlers joined the ex-convicts so that by World War I there were 2,000 inhabitants. Bulana resident Mariana Lindberga, 69, remembers her maternal grandmother describing how it took her a whole year to walk from Latvia. But most others have lived in Bulana enough generations to have forgotten their exact origins. Historical documents show that many of the original settlers were from Kurzeme, the westernmost region of Latvia. The language spoken in the village today is similar to that region's dialect, although it has other peculiarities as well. While understandably many Russian words are used, so too are a few German ones because at the time when Bulana was settled German culture dominated Latvia and many Germanisms were used in everyday speech. However, Bulana's people have no doubts about who they are. "We are Latvians, completely," said Lindberga. "How can you forget your language? Impossible." Escaping their German landlords, Latvians established many other villages across Russia during the last century. There are settlements in the Omsk Region and Bashkortostan on the European side of the Urals where small Latvian communities survive to this day. But Bulana has retained far more of its original identity than any of the others. Probably the main reason is its isolation, which is both a blessing and a curse. The nearest town of any size is 20 kilometers away and the roads are atrocious, even in good weather. A couple of winters ago the snow was so deep that the village was cut off for two months and several people died because they could not get to hospital. But a strong brew of national and religious feeling has also played a part. Lonija Tomane, the village librarian, said that in previous generations parents only allowed their children to marry other Lutherans, which meant that in addition to Latvians, Germans and Estonians were acceptable as spouses. Orthodox Russians were not. Despite official atheism, in Soviet times every village child was baptized by old women who perform the ceremony in lieu of a priest. Nowadays, a Lutheran pastor from Krasnoyarsk, 600 kilometers to the north, visits Bulana once a month. But not everyone is pleased, because he delivers his sermons in Russian some of the old women won't accept him. "A Russian priest? Huh, we need a Latvian. They were communists and now they think they know more about God than we do," said 74-year-old Milda Kadaka. The mystery of Bulana's survival is deepened by the fact that for decades it lost contact with Latvia proper. After the revolution, Russia was virtually isolated from the outside world. For a while, Latvian teachers from elsewhere in the U.S.S.R. came to work at the school, but in 1937 Moscow ordered that teaching be only in Russian. Around this time the Soviet Union also became a hell on earth. The old women are haunted by memories of starvation during the mass collectivization of agriculture and the slaughter of the village men during the purges. Many others died in the war. Ironically, some younger men said their first contact with Latvians from Latvia was on military service when they found themselves in the same units. Also, when Latvia was a Soviet republic, a handful of Bulana residents went there to live. Then in 1975 an eccentric Latvian historian and film maker called Ingvars Leitis literally rode into town. He and a companion decided to visit the sites of gulags and places where Latvians had settled last century, but because this was strictly forbidden, they decided to bicycle from Riga to Vladivostok and tell the authorities this was a tribute to the vast socialist motherland. To their great surprise, in Bulana they found not historical relics but living people. Leitis made repeated visits and when Latvia's independence drive started in the late '80s academics, clergymen, journalists and others went to Bulana to study the place. Since 1989 teachers from Latvia have been traveling there to teach the language; this year, Leitis' son Rihards Asbergs has made the trek. But not everything has been sweet after this reunion. While a number of Bulana residents have over the years resettled in Latvia, others have felt rejected in the motherland. Lonija Tomane spent a year in Latvia in the mid-70s but came home embittered because, hearing her use Russian phrases, people told her to, "go back to Russia." Some of their supporters in Latvia think that, while the Latvian government has bent over backwards to help Western йmigrйs return, even allowing them dual citizenship, they have shunned their poor Eastern cousins. "They don't want us there. Siberian bears, that's what they call us," said Emilija Blumberga, 76. In any case, many dismiss the idea of leaving the place that has been home for five or more generations. After enduring so much over the last 70 years, it might be expected that now, finally, the village would be flourishing. But sadly, it has instead gone into what may be an irreversible decline. agriculture over the last ten years has meant that whereas 70 once worked at the village kolhoz, today there are just 12 employees whose already pitiful wages are in arrears. There is hardly any cash in the village, with most surviving on what they grow in their own gardens. These people have never been strangers to vodka, but despair has now driven many to chronic alcoholism. Under these conditions, it is hardly surprising that most young people leave for the towns. Their children are born elsewhere and are quickly Russified. And there are worries that several Russian families who have recently settled in the village might further speed up assimilation. "Those who stay are those who don't want to study further, and those who don't want to leave their parents without support. When I go, who will come in my place?" asks Janis Melbarzis, kolhoz chairman and village head. His 22-year-old daughter Inga moved to Latvia this summer. But although there were many more in years gone by, there are still 20 pupils at the village school, giving some hope for the future. School principal Vera Gutmane insists that the children of the Russian families are also taught Latvian. University-educated Gutmane is herself a striking exception to the exodus of youth. She insists that if she had to live anywhere else, she would move to Latvia. But she feels deeply at home in Bulana. "My mother is here, my father is here, the graves of my ancestors are here, my roots are deeply in Siberia. I stay here because there are Latvians here, my people."